Even though it was our newborn who was affected with this disease, we had to make the decision to protect her from any of these viruses entering our home, which is why we decided to homeschool our older child to prevent her from spreading these viruses. So in 2015, without a second thought, I decided to preschool my older daughter on my own – and it was overwhelming. I had a newborn with an overwhelming schedule of daily therapy, medicines, nebulizers, and doctor appointments – and not to mention she was a newborn with an exhausting newborn schedule. I realized this first year that I couldn’t give my all to both of my daughters with this schedule, until another mother recommended FLVS. 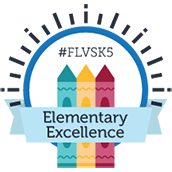 In 2016, I researched FLVS and fell in love with their Flex Elementary program and was so impressed with their lesson plans and reviews. I knew I could utilize their tools, but with my own schedule. As a teacher in the past, I can say that their lesson plans and teachers are amazing and I am so glad I found them. FLVS has given me the opportunity to teach my 5-year-old at my own pace and schedule, while being able to tend to my younger daughter’s special needs. I can proudly say that neither of my daughters have been sick in over two years and I have FLVS to thank. Currently Riley has made As in all her classes, is starting to read, and enjoys her science and math classes the most. Her teacher Ms. Lamb is amazing and we are so grateful for her! 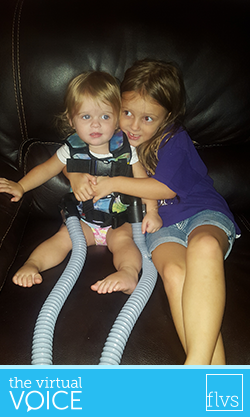 FLVS makes it possible to live a normal life with my two beautiful daughters. This entry was posted in Parent Edition and tagged A Day in the Life of Virtual School Student, Elementary Courses, Elementary Teachers, Flex Elementary, FLVS Flex Elementary, FLVSK5, home school families, Homeschool, Hospitalized and Homebound Students, Legislation, Online Education, Online Elementary, Parent Voice, School Choice, Student Health on April 3, 2017 by Guest Blogger. Okay, I am Hali Douglas. I am 14 and I am a freshman in High school. I read this and I thought that it was really cool and nice to hear that someone else had Cf. Not that it is a good thing but I think that many children who suffer from this lung illness are going to be a bright child from the experience that they are getting in the medical careers. This is one of the things that not only to do I suffer from but she does too. I am sorry that this has happened to your daughter but she seems like a bright little girl and is going to grow into a wonderful young lady. I was diagnosed at 18 months by my uncle. I have struggled with it for almost 15 years. However, I have not be hospitalized in 3 years because of the medication and what it has done for me. Thanks to FLVS I am able to enjoy school and still get all my meds done no problem. Even when I was public school. I did just fine with them I got distracted from time to time and was bullied. I was scared to take meds in front of my friends and teachers. I found a good friend who didn’t care and let me do my thing and helped me remember to do them. She is also home-schooled now and she and I are still friends. I hope that your daughter will have a grand childhood even with Cystic Fibrosis and her PFTs go through the sky like mine do. 110 is my pfts right now and that is amazing. Hope she does amazing in life. Amazing story! I am so proud to be a part of the FLVS family, both as a parent and as a staff member! Being an adult with Cystic Fibrosis, FLVS has given me a chance to have a career in education without having to be in a face to face environment where the germs can have such a profound effect on my health. 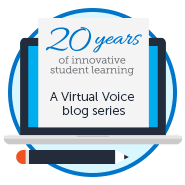 I am happy to see this post and thrilled I can support FLVS. Shanya loved doing her work online the reason we left FLVS is because I had a problem submitting her work. We would love to try again someday if that’s possible. Please let us know if there’s anything we can do to help!